This past week federal officials at the U.S. Fish and Wildlife Service and the National Oceanic and Atmospheric Administration announced a long-awaited designation of critical sea turtle habitat. This designation was made for the Loggerhead sea turtle, one of the five species of sea turtles that visit Florida costs. Officials included 685 miles of beach and 200,000 square miles of water as critical habitat for the Loggerhead in what is the largest such federal designation in environmental history. The Loggerhead sea turtle has been considered a threatened species since 1987. The “designation of habitat” process began in 2007 when the Loggerhead sea turtle was reclassified from a threatened to endangered species. Now, under a new provision of the Endangered Species Act, officials of the U.S. Fish and Wildlife Service and NOAA had to designate critical habitat, which for Loggerheads include nesting beaches and marine areas. Marine areas chosen were those featuring Sargassum beds, seaweed which is the home of young sea turtles. Critical habitat includes both healthy areas and areas detrimental to the survival, recovery, and conservation of the species. Areas currently detrimental to Loggerhead survival include 84% of all known Loggerhead nesting areas, and that includes eighty-eight nesting beaches. While the designated beach areas cover six states, nearly 300 of the 685 miles are located here in Florida. The majority of the Florida beaches involved are south of the Tampa Bay area, beginning around Sarasota and going on and off around the bottom of the state and returning up the Atlantic coast. The Keys are partially included as are some parts of the panhandle, but the Miami-Dade area wasn’t given a designation due to high population density. The Tampa Bay area, including Pinellas County and St. Pete Beach, was also not included in the designation. The designation is intended to create an extra layer of protection within federal activities, developments, permits, and coastal management. 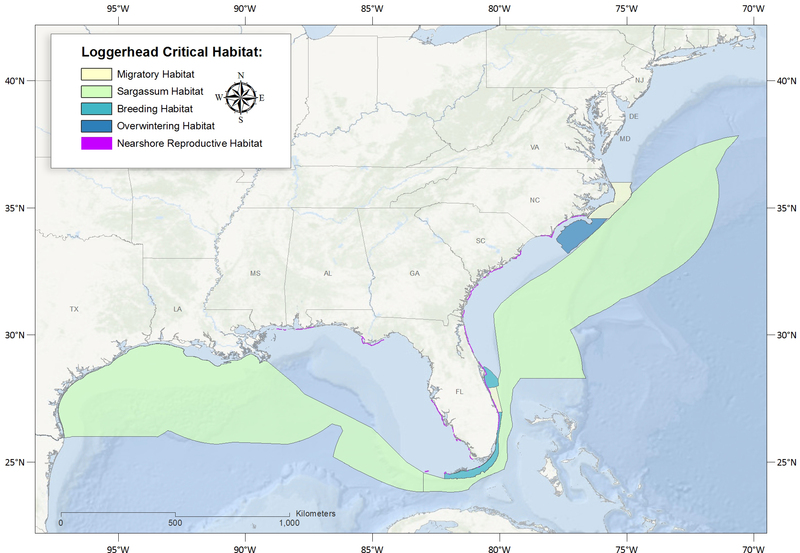 In the specified areas the national government may not destroy or significantly and/or negatively affect sea turtle habitat. However, public access to these areas will remain unrestricted, and current use will be upheld unless it leads directly to the destruction of habitat. Notably, this report only applies when the federal government is involved. Non-federal lands are removed from the designation unless they are receiving federal funding, seeking a federal permit, or some other federal action. This leaves many local and state areas unprotected by the sea turtle habitat designation. There remains a debate as to the long-term effects of this ruling and the potential economic impact. Many have pointed out that local regulations often already cover the stipulations of the federal designation, and the sea turtle’s threatened status and endangered status already offers some protection. The greatest impact will probably be to large-scale beach developments that require federal permits and that also adversely modify the nesting beaches. NOAA and the U.S. Fish and Wildlife Service have promised a financial analysis report by summer’s end, which may affect some of the final lines in the designation.